Tag line: "What happens when six men and three women are alone in an open boat ?" 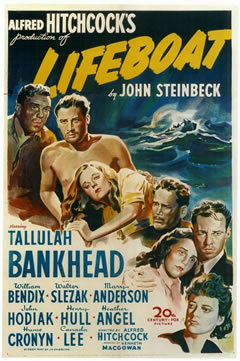 Alfred Hitchcock's 1944 film, Lifeboat, takes place on a single set: a lifeboat, floating in the middle of the Atlantic Ocean. This simple locale forced the great director to temporarily set aside his title as "Master of Suspense", creating instead a dramatic, character-driven tale of love and deception on the high seas, and in my opinion, he did a damn fine job of it. We join the action just as a freighter, which was torpedoed by a German U-boat, is sinking to the bottom of the ocean. Constance “Connie” Porter (Tallulah Bankhead), a well-dressed journalist and former passenger on the freighter, sits alone in a lifeboat, surrounded by her luggage. She’s soon joined by a few other survivors, including former crewmen John Kovac (John Hodiak) and Stanley Garrett (Hume Cronyn), an injured crewman named Gus (William Bendix); nurse Alice MacKenzie (Mary Anderson); wealthy socialite C.J. Rittenhouse (Henry Hull), and assistant steward Joe Spencer (Canada Lee), who saved a woman (Heather Angel) from drowning. Rounding out the “crew” of this lifeboat is Willy (Walter Slezak), a sailor from the German sub, which was also destroyed in the attack. The lifeboat drifts aimlessly for days, and hope is running out almost as quickly as the food and water. What’s more, Willy, who’s actually a Nazi naval officer, is hiding a compass, which he uses to alter the boat's course so that it will rendezvous with a German supply ship in the area. But that’s not the only secret Willy's keeping from his fellow passengers, putting them all in more danger than they realize. Lifeboat has its share of intrigue, most of which involves Willy, who, under the false pretense of guiding the small boat to safety, is attempting to lead his fellow survivors straight to a German POW camp. But what makes Lifeboat such a rewarding film are the interrelationships of its characters, and the way each one responds in a crisis, reactions that will change over time as morality and decency slowly give way to thirst and starvation. When Willy is first fished out of the water, Kovac wants to toss him right back in, and leave him to die. Connie and a few of the others intercede, convincing the hot-headed Kovac that Willy is now a prisoner-of-war, and should be treated as the law dictates. It initially looks as if they made the right decision, especially when Willy takes charge and performs the amputation of Gus’ leg, which had become gangrenous. But as time wears on, and certain facts about their German shipmate are brought to light, even the most mild-mannered among them will take action, lashing out in a way most would have never thought possible. In the long history of motion pictures, many films have demonstrated mankind’s courage in the face of adversity, and its ability to sustain its humanity, regardless of the conditions. This film takes a slightly different approach. Serving as an analogy to WWII itself, Lifeboat shows what can happen when decent people in a desperate situation are pushed to the limit, and decide they're not going to take it anymore.